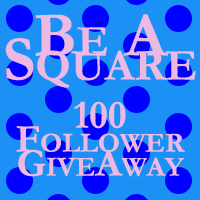 Eli to the nth: BE A SQUARE: 100 Follower Giveaway!!! - CLOSED!! Hey Squareheads! (I've just decided to call my followers that...lol) I've finally decided that I'm comfortable enough with hosting a giveaway! You can use this image on your sidebar if you want! That's right, I want you to be a Square! I'm so thankful for the followers I have now, and the followers to come that I wanted to do something for them. So I've decided that when I hit 100 followers on GFC that I'm going to giveaway a $25 gift card to Amazon or Book Depository!!! In addition, I might throw in some extra books for fun. I like surprises so I hope you do to. Just fill out the form below, and leave a comment telling me what your favorite YA book is! Both are mandatory. You can't win without a comment, and you can't win without filling out the form! GIVEAWAY CLOSES WHEN I HIT 100 FOLLOWERS! Thanks for all the love guys, and good luck!!!! THANKS TO EVERYONE WHO ENTERED AND ALL MY NEW FOLLOWERS!!! I'LL BE PICKING THE WINNER SOMETIME THIS WEEK! Yay! It's really hard to choose a favourite, but I think I have to go with I Am the Messenger by Markus Zusak. I know most people would choose The Book Theif over this one, but I don't know, I kind of love this book infinitely more. It feels like such a classic to me. My favorite YA book is Wintergirls by Laurie Halse Anderson. I'm really glad that another blogger recommended this to me and now Anderson is one of my most favorite authors. My favorite YA books at the moment are still the Twilight series. I could read those over and over again! I haven't read a lot of YA but my favorite would have to be.. the Twilight Saga. I just love that series! My fav. book is the first Hunger Games book. My foray into YA books started with Twilight. I have read several YA novels since then, but I have to admit, Twilight still remains my favorite, although I did love The Hunger Games and Shadow Hills was pretty good too. Definitely If I Stay by Gayle Forman, it's such a beautiful book! Thanks for the giveaway! You should definitely give Jacqueline Carey a try sometime. Kushiel's Dart is the first book. A lot of Voldemort love going around this weekend. :) Thanks for following, I'm a new follower as well! Favorite YA book is hard. I love the Hunger Games and Vampire academy series. ACROSS THE UNIVERSE BY BETH REVIS!!! I love THe mortal instruments series! cassie clare's writing is fab! Thanks for the great giveaway! I love The Hunger Games trilogy by Suzanne Collins. They were great! Thanks for the giveaway and for making it international! Hope you hit 100 really soon! Its really difficult to choose just one! But, at this point, I must say Nevermore by Kelly Creagh! If I don't count Anita Blake Series (I love it!) my favourite YA are Mortal Instruments. These stories are great! My favorites are The Hunger Games Trilogy and The Mortal Instruments series. here you go: one more follower!! thanks for this great giveaway 8D you're the best! The Hunger Games series by Collins is incredible!! Great giveaway and good luck with your awesome blog!! Hmmm... So hard to chose just ONE book! I have so many favorites! At the moment I guess I'd have to say... Linger by Maggie Stiefvater. I LOVE the way this woman writes! Congrat on followers :) My favorite is vampire academy books by Richelle Mead. thanks for the giveaway! congratulations on gathering followers! as of the moment my favorite is the prophecy of the sisters series my michelle zink. Okay, I am not copying when I say Twilight is one of my faves for YA. Also Meg Cabot's All American Girl. Love her wittiness! I'd have to say The Book Thief. One of my favorite young adult books is Hush, Hush by Becca Fitzpatrick. My favorite YA book is the Iron Fey series because I just love Puck XD ..by the way thanks for the giveaway..I think i'm the 100th follower?